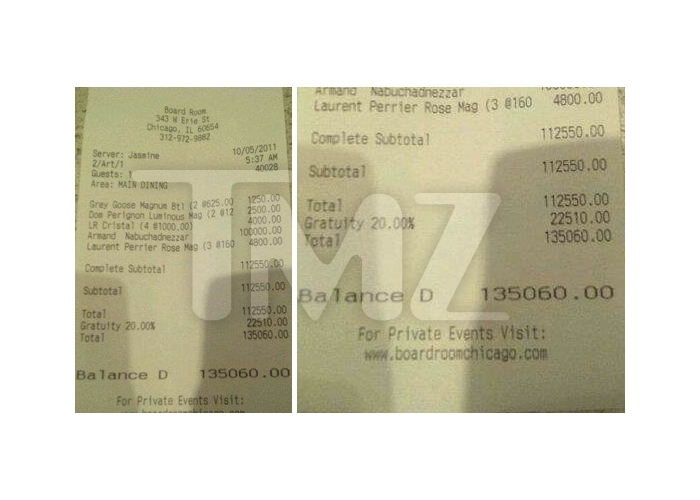 Zac Efron Treated with $100K Bottle of Champagne in Chicago Club. Being a celebrity isn't bad at all as Zac Efron just received a gift of $100,000 from the son of a Russian billionaire, in the form of a world renowned bottle of champagne: Armand de Brignac Nebuchadnezzar Champagne. Find out more details next! It surely pays off to be a celebrity as hot stud Zac Efron proves, as he was treated with a $100,000 bottle of champagne in a club in Chicago. Apparently, the hot stud was treated with the gift by an unnamed person who was partying at the same club. The generous gift didn't leave a hole in the pocket of the unnamed clubber as he is reportedly the son of a Russian billionaire. Zac Efron is currently in Chicago shooting for his upcoming movie, and Tuesday night he decided to hit the Board Room nightclub and what a night, as it's not every day you receive a $100,000 bottle of champagne for free. According to TMZ, the Russian billionaire spotted Zac and his co-stars partying in the club and decided to gift them with a super expensive bottle of Armand de Brignac Nebuchadnezzar Champagne, aka Ace of Spades champagne. The $100K bottle contains 15 liters of champagne, so it's definitely not a bottle that can pass by unnoticed. The unidentified man also bought for his own table two magnum bottles of Grey Goose vodka worth $1250, two magnum bottles of Dom Perignon worth $2500, four bottles of Cristal worth $4000 and three magnum bottles of Laurent-Perrier Brut Rosé worth $4800. 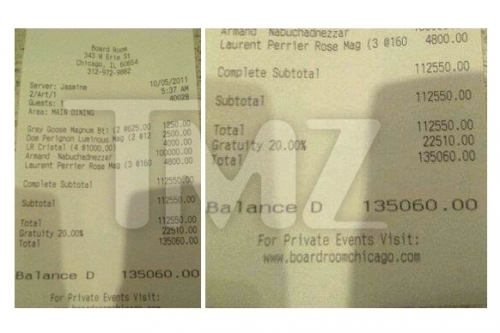 The total of the Tuesday night outing: a whopping $112,550 to which the 'baller' added a 20% tip for the waiter, a $22,510 super tip. Now that is a tipper you remember! So in total, the Russian billionaire had to take out of his pocket $135,060.